The term atmospheric river is used to indicate narrow, elongated corridors of concentrated moisture transport associated with extratropical cyclones. 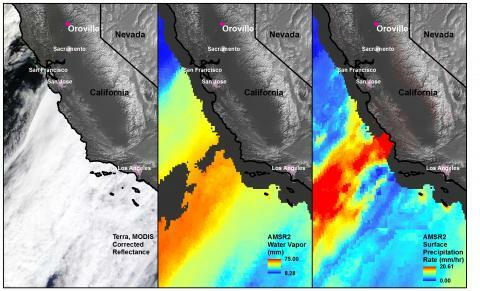 Atmospheric rivers are the largest transport mechanisms of freshwater on Earth. This moisture transport occurs under particular combinations of wind, temperature, and pressure conditions. Atmospheric rivers are typically located within the low-level jet, an area of strong winds in the lower levels of the atmosphere, ahead of the cold front in an extratropical cyclone. Based on satellite observations, an atmospheric river is greater than ~2,000 km (1,245 miles) long, less than 1,000 km (620 miles) wide, and averages 3 km (1.8 miles) in depth. A study by Ralph et al. (2013) found that typical atmospheric river conditions last around 20 hours over an area on the coastline. Strong landfalling atmospheric rivers interact with topography and can deposit significant amounts of precipitation in relatively short periods of time leading to flooding and mudslides. Atmospheric rivers also can have beneficial impacts by contributing to increases in snowpack, such as in the western United States. An example of an atmospheric river is provided in the image to the right from 14 February 2019. 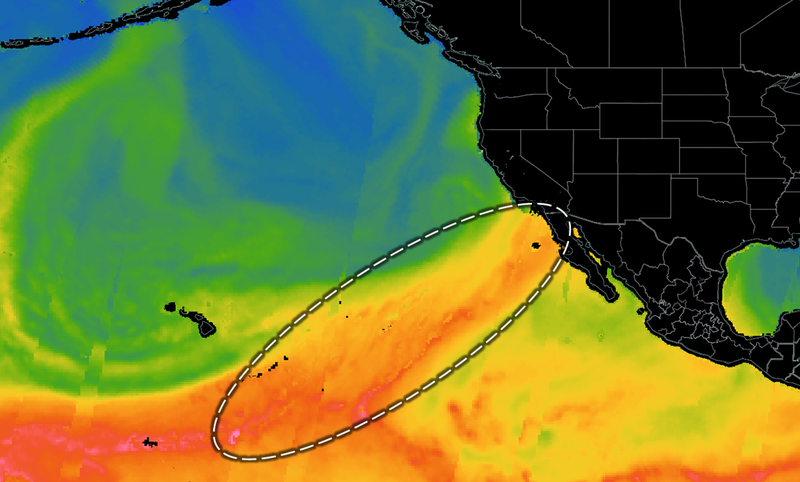 This atmospheric river extends from Hawaii to California as highlighted by the dashed oval. The observations are from one day of observations from the Special Sensor Microwave Imager / Sounder (SSMIS) on the Defense Meteorological Satellite Program (DMSP) satellites DMSP-16 and -17 as well as from the Advanced Microwave Scanning Radiometer 2 (AMSR2) on the Global Change Observation Mission - Water (GCOM-W1). How do atmospheric rivers occur? Atmospheric rivers are a part of the larger system of extratropical cyclones that transport heat and moisture from the tropics toward the poles. 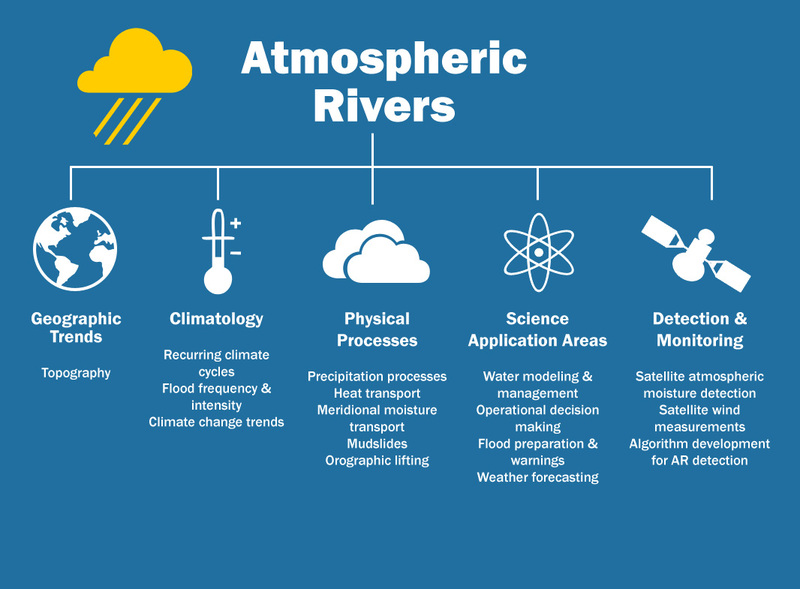 There are many factors that contribute to the formation of atmospheric rivers. Conditions usually include high humidity levels, strong low level winds, and a moist neutral atmospheric profile, which allows for extensive precipitation production when air is lifted orographically over geographic features, such as mountain ranges. Atmospheric rivers primarily occur during winter of the respective hemisphere (i.e., December, January, and February for the northern hemisphere and June, July, and August for the southern hemisphere) when extratropical cyclones are most prevalent. The atmospheric rivers that cause significant precipitation and flooding events are those associated with stalled or slow moving systems. The strength, frequency of occurrence, location, and precipitation production of these systems can vary based on existing climate patterns, such as the Madden-Julian Oscillation (MJO), the Pacific/North American teleconnection pattern (PNA), or the El Niño–Southern Oscillation (ENSO). Where do atmospheric rivers occur? Atmospheric rivers typically occur in the extratropical North Pacific/Atlantic, southeastern Pacific, and South Atlantic oceans often making landfall on the west coasts of North and South America. Other regions that experience atmospheric river landfalls include Greenland, Antarctica, and the south-central United States. Atmospheric rivers play an important role in the global distribution of freshwater with their significant contribution of rain and snow to the water budget of western states of the United States, which is vital for water storage and management decisions in the region. 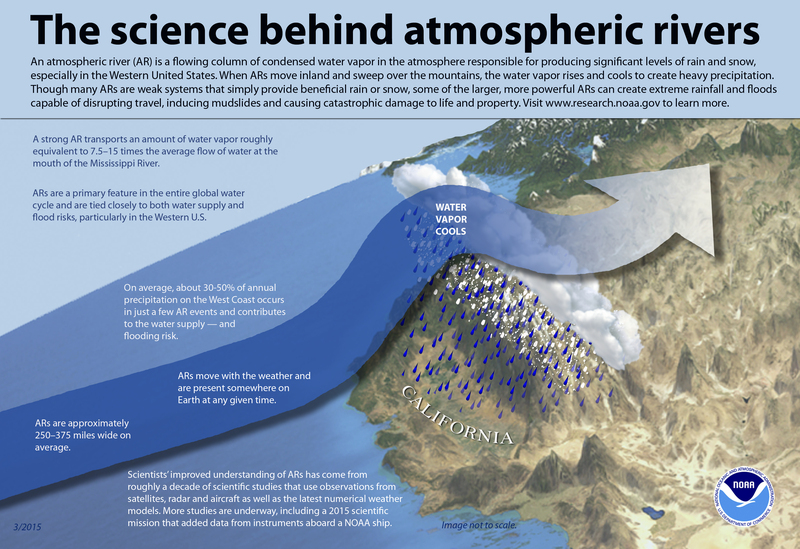 HOW ARE ATMOSPHERIC RIVERS STUDIED? Algorithms based on integrated water vapor and water vapor transport have been developed to automatically identify the long and narrow signatures of atmospheric rivers in satellite data. To gather these measurements, satellite microwave radiometers are used to measure the integrated water vapor content in the atmosphere. For identification of atmospheric rivers in satellite or model data, scientists look for corridors that are greater than 2,000 km (1,245 miles) long and less than 1,000 km (620 miles) wide that have at least 2 cm (0.78 in) of vertically integrated precipitable water. Once an atmospheric river makes landfall, wind profilers are often used to measure the horizontal wind conditions at different elevations and identify areas with strong low level winds. A collection of other instruments including rain gauges and ground radars are used to study atmospheric river characteristics and effects.